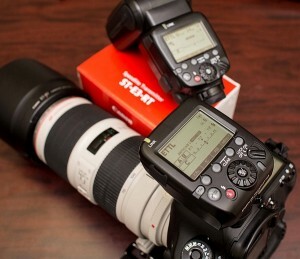 I just bought the Canon ST-E3-RT which is a wireless radio controller that will work with my Canon 600EX-RT speedlites. The picture on the left shows the unit mounted to my Canon 5D Mark III hotshoe and the 600EX-RT flash in the background. The ST-E3-RT has a display that mimics the back of the 600 speedlite. One of the many nice things about it is that it allows for wireless TTL shooting without mounting anything to the speedlite which would be required with most non-Canon brand TTL options. With TTL, the flash can be set up quickly because everything works together, camera and speedlite, to get the exposure correct. However, the image of the lady on the right had a minor adjustment even in TTL mode of +2/3 increase in speedlite output. For the image of the lady on the right, I used a portable, fold up, 27.5 inch beauty dish from Phottix which can be found at B&H. I had a standard light stand with a Bowens mounting bracket to attach the beauty dish and the Canon 600EX-RT. I used the ST-E3-RT on the hotshoe and had the speedlite to +2/3 power because regular power just didn't seem good enough. The f/stop was set to f/5.6 on a Canon 70-200mm f/2.8 lens. It's a relatively simple one light setup. My main exposure was balanced to even with the speedlite used to fill in. The image has been edited and is not straight out of the camera. Side Note: You may be thinking from the +2/3 that has been mentioned twice now that with TTL mode that shouldn't be necessary. I have two thoughts on that: 1) I like my images to POP a little more and find that a slightly higher setting accomplishes that. 2) With the beauty dish being used outside, I felt their was a need to go +2/3. Keep in mind that TTL is nice, but like anything in photography, it's the OPERATOR that makes the difference. Even if you own a consumer camera with a kit lens, you can get similar results if you have a flash. You don't have to have everything that I have mentioned here. I would recommend that you use fill flash for outdoor portraits. You can start with a Rogue Flash Bender for about $35 and work your way up to have some of the extras mentioned here. Don't let equipment hold you back from trying new things like using fill flash outside. You can even start with a simple MANUAL flash for under $100 if you cannot afford a flash that has TTL. However, your long term wish list might include the Canon ST-E3-RT and the Canon 600EX-RT speedlite if you are a Canon shooter. No matter where you are at in your photography beginner, hobbyist, advanced, intermediate or professional, you should always do your best with what you have. The key is to go beyond your regular shooting and try new things especially when it comes to fill flash outside if you are not already using a speedlite or studio strobe outside.